Today was a short day—28 nautical miles of protected water from Ganges to Silva Bay. We left about 10:30 a.m., transited Gabriola Pass just before slack at 2:01 p.m., and arrived in Silva Bay soon after. Easy, smooth water along the way. A bit of drizzle, but very little wind. We had a relaxed afternoon at Silva Bay. Some folks dropped crab traps, others hung out on the docks. I helped people sort out boat problems (electronic charts, electrical issues, watermaker problems, and a few other odds and ends). After solving the problems, we made some time for flying drones (Event Horizon also has a DJI Phantom aboard). A certain member of the group (Brittany on Doll Face) decided that we need to jump in the water every day for the duration of the trip to keep the trip "youthful." Today I obliged. So just before happy hour, three of us leapt off Safe Harbour. I had the drone hovering (and recording) our swim...turns out I was in the water for a mere 16 seconds. No, it wasn't cold...brrrrrr...it wasn't cold...I swear! But the hot shower on the swim step sure felt good! 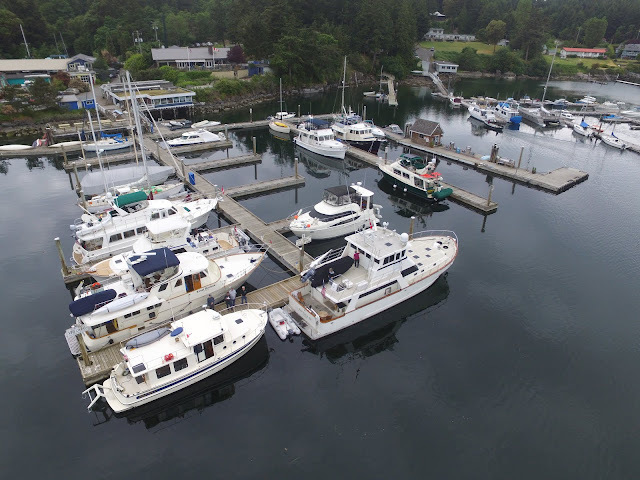 Tomorrow we're off to Pender Harbour. The forecast is for calm winds on the Strait of Georgia. I sure hope the meteorologists are right!